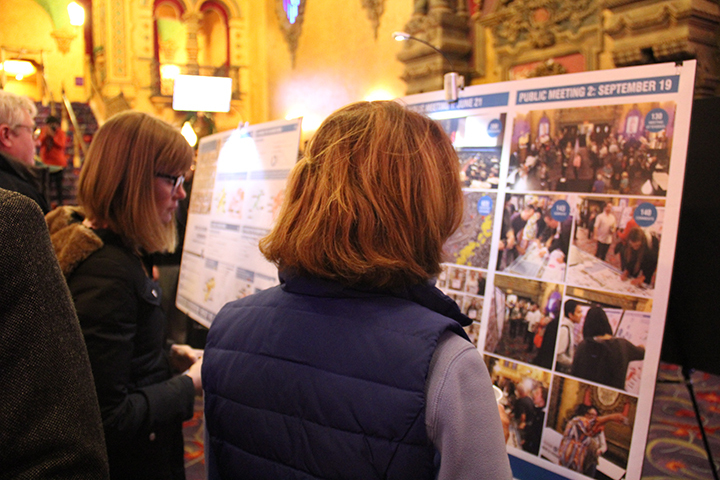 MKSK presented an overview of the 10-year action plan for Downtown Akron to approximately 175 members of the public gathered at the historic Akron Civic Theatre. At this final public meeting,the community saw and heard how their ideas translated into concepts and strategies for the Downtown Akron Vision and Redevelopment Plan. Mayor Horrigan concluded the presentation by pledging city support to implement the components of the plan created through such an engaging community involvement process. Ideas were synthesized from a robust stakeholder and public process of focus groups, surveys, and workshops guided by the Downtown Akron Partnership and a 42-member Steering Committee in collaboration with MKSK. MKSK presented concepts for five focus areas including Main and Exchange Streets, the Northside, the Bowery District, Canal Place at South Side, and the decommissioned Route 59. The Plan calls for an emphasis on growing and creating more residential neighborhoods downtown to return vibrancy to the core and to set the stage for additional investment. The overarching focus is on Main Street as a catalytic investment area for a mix of infill development with walkable, multimodal connections to surrounding neighborhoods, districts, and the Towpath regional trail to attract the next generation of residents and workers to Downtown Akron as a place to live, work and play. Main & Exchange Streets – The vision for this section of the corridor focuses on activating the area adjacent to the ball park with improved streetscape and mixed use infill development that would replace many of the surface parking lots – creating a dynamic corner downtown. Canal Place at Southside – This vision proposes adding infill development with first floor retail to anchor Main Street and grow the Canal Place Innovation District. It includes enhanced, pedestrian-activated spaces consisting of an extension of the Main Street Promenade, connectivity to the Freedom Bike and Hike & Towpath Trails, a connected Transit Center to the Wolf Ledges Parkway and a new urban plaza. New residential development is also proposed along the Ohio & Erie Canal to bring that area to life. The Bowery District – This district was identified in public meetings as one of the most visited areas of downtown and an area that is already expecting several redevelopment projects. Already a hub for cyclists and visitors to Locks 3 and 4, proposed improvements would build upon current proposals with repaired access to Cascade Plaza, public realm improvements, an enhanced Towpath Trail extension to the Main Street Promenade, complete street enhancements along Bowery Street, and infill mixed-use development that frames and reinforces the public space. Northside – The vision promotes activating and enhancing the area by converting unused expanses of asphalt into a central green promenade and better connecting the Northside to Downtown and Main Street via a pedestrian walkway and at-grade, signalized railroad crossing. It also envisions continuing to infill the area with townhomes and restaurants with outdoor dining. State Route 59 – Identified as the least friendly to pedestrians, this entry into downtown would develop the additional open space gained from the recent Innerbelt decommissioning project as a mixed use district that connects to adjacent neighborhoods and provides a new urban green space to the south and a gateway to Cuyahoga Valley National Park to the north.